We took a day during spring break to visit the aquarium. It took as an hour-and-a-half to get there, the tickets were expensive, and when we arrived, the line to get in stretched outside. I almost left, just turned around and found some other place to visit for the day. But we stuck it out and in the end, it was one of those days where everything turns out just right. We stood at the otter exhibit just as a museum volunteer walked over and announced we could watch them feed the otters. Later we walked by the huge shark exhibit just as another keeper told the crowd it was time for a “shark talk.” Sharks are my sons super-favorite. So, when my son declared it was the “bestest day” ever in his entire four-year-old life, I figured he must have forgotten the trip to Disney, but yeah this was a pretty great day. But then the next day was his bestest day ever, too. We played mini-golf and ate scoops of ice cream, so I nodded knowingly . Yes, it was a good day. Then came Monday morning and the end of spring break. We rushed right back into school and activities, but that hadn’t changed his perspective. That was “the bestest day” he had ever had also. Cleaning and errands and hanging out at home? This is the bestest day? Now every day is the best day, whether he heads to preschool in the morning or stays home, whether we visit the post office or the library, whether we run errands or take a walk, whether it’s the weekend or a rushed and busy weekday. “What makes the best day?” I finally ask him. “When people are nice to you,” he says. A few nice words, a sweet smile, a pleasant encounter and that’s a great day. Not just a great day, but the best day. Of course, people aren’t always nice. Sometimes we have hard days or even difficult seasons. We know it’sure doesn’t feel like “the best day ever.” Maybe instead it’s disappointing or long, rushed and breathless, stressful and tense or simply and deeply sad. On those days, when crawling back into bed sounds like the way to go, we rely on something more. It’s got to be more than trips to the aquarium or ice cream night or simply the kindness of a friend that helps us hold onto hope and trust in God’s love and His plans for us. We believe in His goodness. That He will not abandon us. That He is not out to harm us or to arbitrarily or apathetically watch us suffer. He is with us in the pain and in the hard days and He is helping us and holding us. Oh, how abundant is your goodness, which you have stored up for those who fear you and worked for those who take refuge in you, in the sight of the children of mankind! (Psalm 31:19 ESV). Sorrow, distress, grief, anguish, groaning, affliction, and weakness– and yet David declared the abundant goodness of God and trusted that God had a plan for his future. I consider Abraham. How God had promised him descendants that would outnumber the stars and, not jut that, but a land of promise, a place to call home. But the very first time Abraham arrived in Canaan and set foot on the Promised Land,there was famine. He had to head onto Egypt in order to survive. And the very first land Abraham ever owned in Canaan was the burial plot he purchased for his wife, Sarah. This was the Promised Land? This was what he had journeyed for? Famine and mourning? Still he trusted and still he praised, because God’s goodness never changes. His loyal love for us remains steadfast. We just keep looking up. Abraham looked to God for fulfillment rather than in the promise itself. David looked to God for strength when His enemies surrounded him. We also can look up, seeking Jesus and His goodness. It may not be the bestest day ever in our life, but the day of trouble does not change the goodness of God. His goodness is our refuge., our safe place, every single day. There’s a couple in our church who’ve been married over 60 years. They’re in a season of jet-setting, of cruises and spontaneous trips up to New England to see the fall leaves. They drive all over to visit family and seem busier now than I am with my four kids. They’ve known sadness too. They’ve had cancer, lost family members to cancer, even lost a child to cancer. These are the best days, when your kids are young. I remember when all our kids were little and at home and it was crazy, but those were the best days. I didn’t catch any other part of that conversation, but oh how those words dug down deep within me. It’s so true. Our kids are getting older, getting ready to stay home alone and even babysit younger siblings. It won’t be long (dare I say it?) before my oldest daughter can drive herself to activities. What a day that will be! This is a new era for me. And it’s just the beginning. I’m living a life without strollers, diapers, wipes, and juice boxes. I should be excited. This is a new season, and it’s a beautiful season. But I truly treasure the wisdom from this church-friend of ours because even on days when I’m rushing from activity to activity, breaking up sibling spats, or navigating a grocery store with the ‘help’ of my preschooler, even on the days when I’m most exhausted or most overwhelmed, I hold onto his truth. These are the best days. I will never have them again. I may get to go on weekend getaways with my husband. I may be less of a taxi driver and more of a world traveler. BUT OH THE BEAUTY OF THE NOW. Oh the beauty of making this family and loving this family through its most significant character-forming, faith-building, family-identity-forming era. This gentleman isn’t the only one who has given such a gift of wisdom and perspective. Last Easter, a dear friend in my church, a joy-bringer and encourager, gave me a little gift with a hummingbird on it. She said the hummingbird made her think of me, flitting about, always moving, so beautiful. This was another treasured gift. I wage this constant battle for balance. I’m a doer who is happy doing, and that’s something God created in me and what God creates is good. But I have to choose and discipline myself for rest, for beauty breaks and for finding room to breathe. I know this about myself. I know my weakest weakness and how easy it is to call me out for doing too much. But she chose to see the beauty. And the funny thing is I’d never seen a hummingbird, not in my whole entire life, until about two years ago when we planted butterfly-attracting plants in our back garden. Turns out hummingbirds like these flowers too, and they hover all summer long right next to the window where I write every day. They have become God-gifts to me, sightings and reminders that God sees me and knows me, He made me and He loves me. He helps me know when to do and when not to do. He guides me ever so gently and cherishes me the way He made me. These are the treasures I receive from God’s family, just two of many gifts I’ve been given, words of hope or encouragement, wisdom and perspective. Then Saul’s son Jonathan came to David in Horesh and encouraged him in his faith in God (1 Samuel 23:16 HCSB). David was on the run once again from Saul’s envious wrath, and he discovered that the city he was hiding in planned to betray him and him over to Saul. So David escaped with his men into the wilderness. If ever he needed a treasured friend, it was in his wilderness season. And Jonathan was that friend. Can we be a Jonathan for another today? Can we give a treasure away, encouraging someone in her faith in God, share wisdom, see beauty, give hope? This independence-training has been gradual: a few hours of preschool a few days a week. School days. Middle school starts in just two months for my middle girl with more decisions, bigger ones, and more independence. My life the last few weeks has been all about inspections as we prep for our move. This is nerve-wracking and stressful. We frantically scrub every speck and spot and we pick up every last toy/sock/book/cup/out-of-place thing. Then we turn on the lights, lock the doors and leave. Then, while we’re away, inspectors come and look for things wrong with our house. They don’t look for what’s right. No one comments on an inspection report about how well we took care of this or how well we cleaned that or how nicely the light shows off the new floor or how they love my furniture layout. They are looking to pick and complain and find the negative. Then, as if writing it all down wasn’t enough, they take pictures and draw gigantic arrows to show off the imperfections (just in case you missed them). When all that’s done, they send the inspection report to others so everyone now sees everything that is wrong. I have spent most of my life trying to fix or at least cover over personal flaws so they are as unnoticeable to others as possible. That’s because I have this intense sensitivity to criticism. When the phone rings or when the email comes through, my first reaction is to make sure no one is mad at me or disappointed in me. So, maybe this brokenness within makes me more sensitive to this whole inspection process. Maybe you’ve felt the hefty weight of criticism thrown your way recently? Maybe it feels like another has set herself against you. So often, these relational breakdowns are caused by a colliding of misunderstandings. Motives are misinterpreted. Words taken the wrong way. Or maybe we really messed up. Sure, we made a mistake. We do that sometimes. Honestly, maybe we even do that often. And we’re sorry, so very sorry, but we’re imperfect. And we desperately need the breathing room of grace when we feel suffocated by the demands of perfection. Long before David became King of Israel, this teenage shepherd boy visited his older brothers at their military encampment. That’s when he first saw Goliath and the giant Philistine mocked God and taunted God’s people. The Israelite soldiers stood around shaking in their boots instead of standing up to the enemy. None of this made sense to David, so he asked a simple question: “Who is this guy? How dare he talk about God that way? What are we going to do to him?” (1 Samuel 17). Now Eliab his eldest brother heard when he spoke to the men. And Eliab’s anger was kindled against David, and he said, “Why have you come down? And with whom have you left those few sheep in the wilderness? I know your presumption and the evil of your heart, for you have come down to see the battle.” 29 And David said, “What have I done now? Was it not but a word?” (1 Samuel 17:28-29 ESV). It was unjust and unkind. Eliab claimed he knew exactly what was in David’s heart and it was evil. But of course, Eliab was wrong. David spent a lifetime responding to harshness and unfair criticism. From his brothers. From Saul. From his son, Absalom. That’s enough to make a guy withdraw inward, to hide away in fear, to cower. Instead, David leaned into the assurance that God was for him. What can man do to me? (Psalm 56:11 ESV). We have an assurance we can lean into also when we feel battered and bruised by condemnation and when people seem eager to pounce on our imperfections. God loves us enough to cover us with the cross. There’s nothing negative within us, no sin we’ve committed, no mistake we’ve made that isn’t fully and completely covered by Christ’s death in our place. He is not out to get us. He is not inspecting us for all that’s wrong and then condemning us for every flaw He finds. He is gently making us more like Jesus and loving us the whole time. So let’s give it to Jesus and move on. Let’s rest in grace instead of battling the self-condemnation. Let’s trust Him with our reputations when others accuse us unjustly. Let’s keep moving forward instead of being cemented to a place of shame or bitterness. Oh, and this: Popcorn and movies. That’s what my two-year-old thinks anyway. This week, we trekked down the aisle at the theatre, searched for an empty row, and plopped down into our seats. They were the cushioned kind that pop up as soon as you stand. Then we waited for the movie to begin as other strangers filed in around us. I hastily leaned over and in a whispered voice tried to explain. This wasn’t THAT kind of movie theatre. We weren’t there for the latest Disney flick. We were tourists preparing to watch the free 20-minute movie for visitors to Jamestown. But this, of course, didn’t make one bit of sense to my little guy. We’ve taken him along to a few movies and this is what he knows: Theatre seating, big screen in the front of the room, people all around = popcorn and a cartoon. And popcorn is pretty much his favorite food on this entire planet. So, he asked again. And again. And again. No, babe, I’m sorry. No popcorn for this movie. The movie hadn’t even started yet and I was failing to keep the two-year-old quiet. I could hear the family behind me snickering. But that’s just about when the movie started up (thankfully) and he was (temporarily) distracted by some film clips of animals and ships. I understood his confusion. Sometimes, the equations in life and in faith don’t seem to work out the way we expect. Or maybe the way they’ve worked before. Or the way everyone tells you it’s supposed to all work. Pray the promises of Scripture. Pray with confession and repentance…with worship…with others. Pray first thing in the morning. Pray on your knees. Pray the Lord’s Prayer. Pray for mercy. This should be like movies and popcorn. You go to the movies; you get popcorn. They just go together. In the same way, you pray correctly and you get answered prayers. We know the truth of this. Sometimes the wait is long. Sometimes the road is treacherous and uncertain. And sometimes you go to the movies, you sit in the theatre seats, you stare at the big screen…but you don’t get popcorn. What do we do when we have prayed faith-filled, persevering, worshipful, honest prayer and God remains silent or even tells us “no”? What happens when we’ve done exactly what we’re supposed to do and the miracle delays or doesn’t come? .Although we are tempted in times of agonizing silence to think of God with an icy stare on his face, refusing to make eye contact, I have found it comforting to think of God simply sitting with us in our pain, quietly listening. Maybe what feels like awkward and anxious silences to us are actually full and gentle silences… When God is listening to us, even if we do not experience the results we hope for, he is actively disposed toward us. This image of God sitting with me in my sorrow doesn’t solve every problem. Pain is still pain. Need is still need. Disappointment is still disappointment. But God doesn’t stand far off, oblivious to my hurt, hard-hearted and unmoving, or deaf to my pleas. Perhaps He is closer than ever. therefore I will call on him as long as I live (Psalm 116:2 ESV). We pray and we keep on praying, we open our hearts to Him, because He listens and because He loves us. and by night, but I find no rest (verse 2 ESV). and there is none to help (Psalm 22:11 ESV). Even in the silent seasons, we have His presence and we rely on His nearness, and that makes a difference for us. I’m not arguing my case in a courtroom before a stern and unmovable judge. I’m with the God who loves me. He wipes my tears. He holds me close. 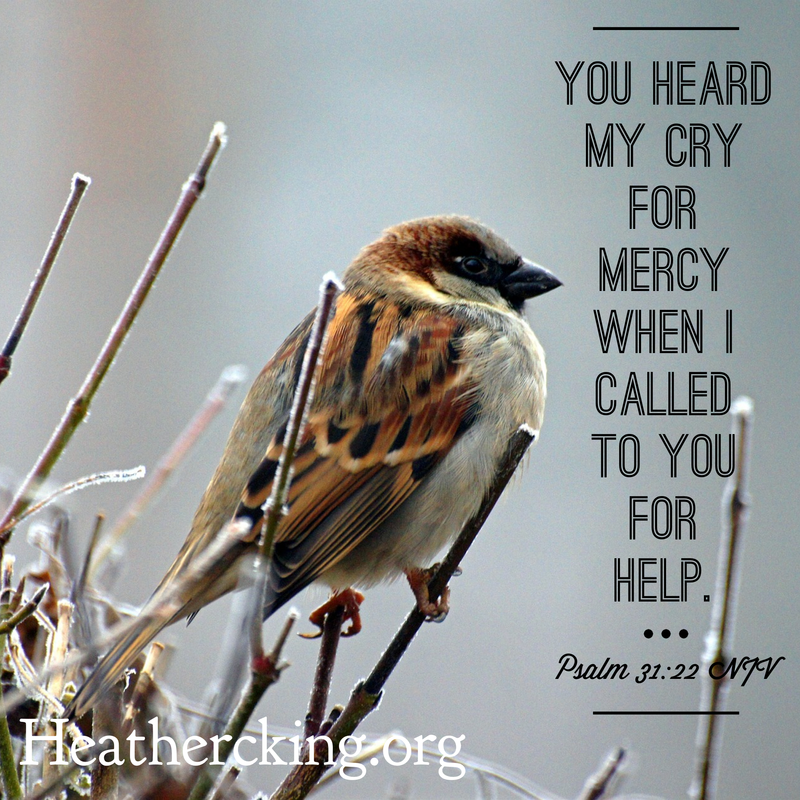 He hears my cries. He knows my need. And even when I don’t understand, He still cares for me with compassion and mercy. Why Can’t I Go to the Carnival Now? We’re fully immersed in end-of-the-year testing for my school-age kids, which in Virginia means taking the SOL’s (Standards of Learning). Maybe you think that means we’re stressed or anxious. Actually, we’re doing a lot of celebrating. The girls get more than cereal or toast for breakfast on SOL days, and it’s not often they wake up to a hot breakfast on a Monday morning. I leave them extra notes of love and encouragement in their lunch bags and slip in treats as well. They don’t have their regular homework load (hurray!) and we can spend the afternoons playing, relaxing and occasionally running out for ice cream to reward them for their labors. We celebrate every day they finish a test because we’re one step closer to summer. So for my first grader—who is too young to take the SOLs (they start in third grade)—all this celebrating seems suspiciously unfair. Even if she also gets hot breakfasts, ice cream treats, and fun nights just like her older sisters, she’s pretty sure she’s missing out. That’s why she was bawling at bedtime last week, because her older sisters get to go to the SOL carnival and she can’t. This carnival is for all the kids at school who take the SOL’s, which means third graders and up. My first grader has a problem with that. No water slide? No games with prizes? No cotton candy? No face painting? No popcorn? She’s pretty sure she can’t wait until she’s in third grade to experience the joys of the SOL carnival. Why should she wait, after all, when the older girls are having all the fun now? We try to reason with her. How the SOLs are hard work and this is their reward. Would she want to take those tests now when she hasn’t learned what she needs to know? We explain how her sisters didn’t get to go to the carnival in first grade either. They also were first graders who didn’t get to go once upon a time. Why rush these things? Sure, there are incentives to growing up. But there are responsibilities, too. There are drawbacks and hard jobs and lots of work. We want her to enjoy now. She wants to rush on to what she imagines is the glorious future. She overlooks the hard and longs for the ultimate reward. We’re asking her to wait. And waiting is tough. Waiting requires trusting God’s timing. Waiting demands patience. Waiting wearies us because even though we’re moving forward on this journey, sometimes we just feel stuck. Waiting means lingering with God in the here and now instead of wanting the end already, can we just skip to the end?! Waiting tugs at our faith and nudges us with doubts because we wonder if God has abandoned us and forgotten us along the way. I wonder how much I’m like my little girl, so obsessed with future blessing that I want to skip to the end? And what would that truly mean? It would mean missing the journey. It would mean receiving blessings I’m unprepared for and responsibilities I can’t carry. In 1 Samuel 16, Samuel the prophet anointed the teenage shepherd boy, David, to be king of Israel after Saul. But that doesn’t mean they held a coronation ceremony right away. No, Saul was still the king at the time, so David just went right back to the fields to tend sheep. Then he defeated Goliath and went to live in Saul’s palace a while. Then Saul’s jealousy became rage and David spent 13 years running for his life. Even then, David didn’t rush to take the throne. Instead, he spent another 7-1/2 years reigning over Judah alone from a city called Hebron. “David was content to stay where God told him to stay for as long as it took” (The Longing in Me, p. 93). All those years of waiting (more than 20 !) between the moment that oil poured down on his head to anoint him as king and the moment when he settled into the Jerusalem palace, David didn’t seem to push ahead. He didn’t kill Saul. He didn’t start public opinion campaigns to sway the populace to his side. He didn’t connive or contrive, plot or plan a way to skip to the end. Can we trust God like that? What a day it must have been when David finally sat on that throne in Jerusalem. King. After all those years. God had done the work. David hadn’t pushed it along or made it happen. God had done it. All God and only God. May that be our testimony too when God completes the work He’s doing in us.